Range: Sahar Desert, tropical Africa and Asia, mountain ranges and sandy plains. Habitat: In the dry season of the year they roam in bushlands and semi-deserts. In the wet season the gazelles can be found in the Sahara Desert. Diet in the wild: shrubs, succulents, on occasion desert grasses, and herbs. Weighs anywhere from 90 - 190 lbs. Can range from 3 to 4 ft in height. The horn are mostly curved at the tips. Their coats are mostly white, with brown patches over the neck and back. Females have more white in their coats than males. Gazelles travel in herds anywhere from six antelope to thirty antelope. This animal is known for its beauty, grace, and gentleness. There are twenty-five different species of Gazelles. The gazelles are also known for their fast and swift running. 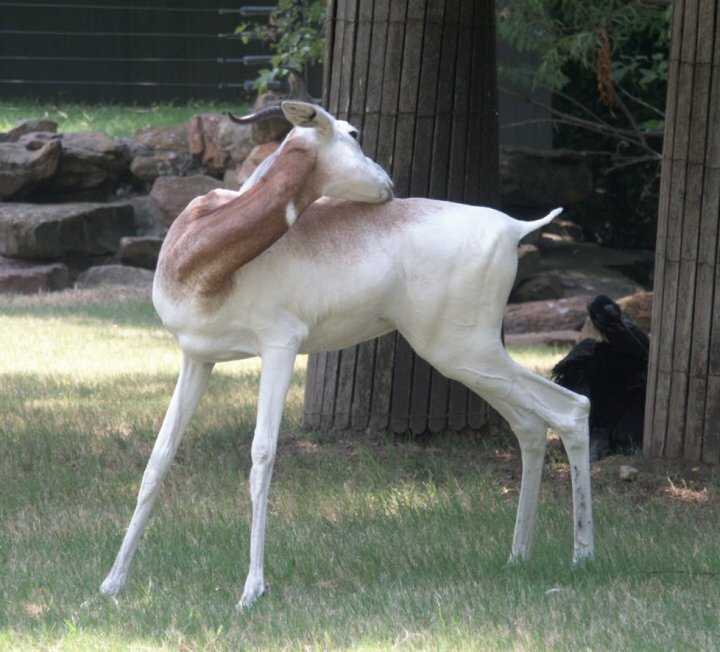 The word Gazelle comes from an Arabic word meaning to be affectionate. Gazelles can tolerate long periods of time without a drink. This species seems to be somewhat afraid of most other species. The are more likely to hide and migrate in hidden places, rather than out where people or other animals are. 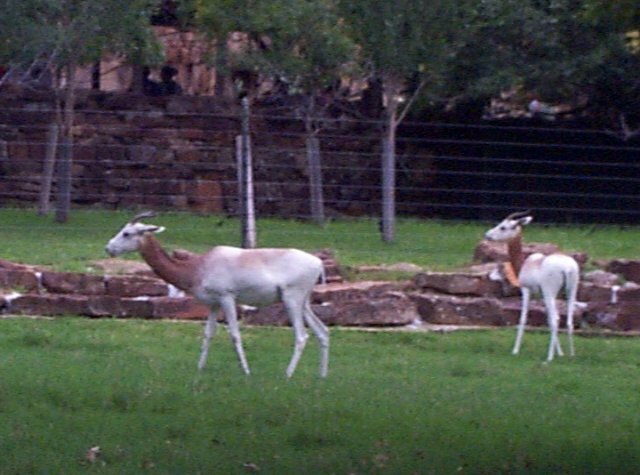 The Gazelles of the Fort Worth Zoo are pretty much explained by the information above. 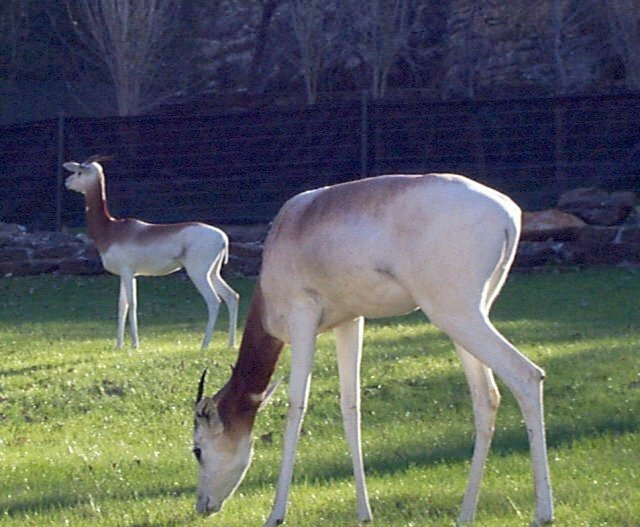 The Gazelle is graceful and are playful among members of its own species. They will not associate with many species around them. Other animals in the Gazelle Exhibit include the African Ground Hornbill and the African Crowned Crane. 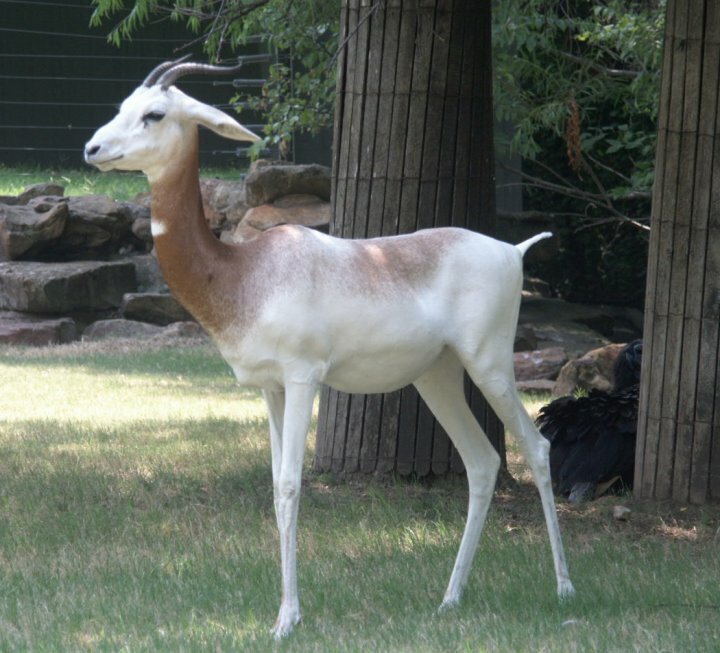 An adult Gazelle has a pure white head. Many but not all have a white spot on the neck. The females in this species are much smaller, maybe not in body mass but their features are more delicate. The females have smaller horns, more slender legs and barely have a tail at all. They were not active during the day. The keeper said they are most active during the night, and early morning. The World Book Encyclopedia, vol7. 2895-2896.